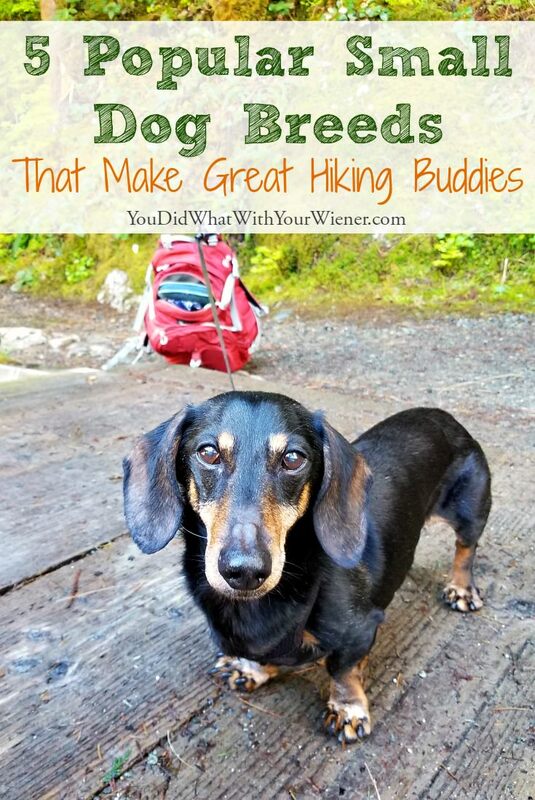 While I own and hike with Dachshunds, I’ve also researched other best breeds for hiking in the small dog category. There are a lot of advantages to hiking with a small dog so I want to help spread the word that they can make great adventure companions. To read more about these breeds, their potential health problems, read 15 Small Dogs Breeds That Make Great Hiking Buddies. I can vouch for the Chihuahua!! We certainly hike often enough in both urban hikes and wild. And all terrain too … woodland, mountain … he seems cool with anything we toss at him and … mine is only 3.5 pounds. Talk about tiny but mighty. extra note for tiny Chi’s – bringing high density food is vital they burn their calories faster. Proportionately speaking they have “more work” so to speak to keep up. So glad you included the Chi on your list. I know two hiking Maltese! How they keep that white fur from mess beats me! That’s a good tip Sonja. Small dogs may be able to keep up but they do often burn a ton of calories while doing so. I can’t imagine hiking with a 3.5 lb dog. I hope I get to meet you and Monte someday in person. Oh I hope so too! We may just have to plan a trip with “hiking with the Weiners” in mind! I’ve always wanted to have a HUGE dog (although we’ve always had medium size ones), but as we get older, a small dog appeals! I definitely see the benefits of having a dog you can pick up! And we do love to hike, so maybe our next dog will be a small hiking dog. My sis and her hubby are on their second corgi and they are definitely good hikers! Yay for hiking Chihuahua love!!!! Leeloo just finished a weekend of hiking almost 20 miles! And she’s 7 years old now! As you would expect, many people live on boats with small dogs (not everyone is stupid enough to live on a tiny boat with a golden retriever). I was very surprised to see that dachshunds and Jack Russell terriers are among the most popular boat breeds. I suspect their people are attracted to little dogs with big personalities. I would also expect both of those breeds to really enjoy exploring on a long hike. This was interesting and fun to read! People don’t realize that the original purpose of a breed has a lot to do with the dog of today (provided it is fairly much a purebred dog). The Yorkie surprised me because I’ve always thought of them as strictly lap dogs :). Can I chime in with a plug for the Miniature Pinscher? I do not personally have any, however, I have a friend that is a lifelong lover of the breed that has three of them. They are really great on a trail. The have a high pack drive and super people loyalty which keeps them from wanting to run off (like a beagle probably would be tempted to do) which is an important trait to have on the trail. They are also super agile and athletic. I have heard they can be difficult to train but my buddy has had no trouble with them. Of course, he also doesn’t free feed them, and uses food as a motivator. Thanks for posting about the little dogs….too often overlooked for people with active lifestyles. Little dogs travel so much easier than larger ones. Also, packing food for a week for a 10 pound dog is WAY easier than packing for a 70lb dog, lol. High time these little guys get some credit for being great travel companions. Jack Russell Terriers are most definitely great hiking partners. We have one full blooded, and 3 mixes ranging in age from 3.5 to 11 years. And even the 11 yr old can run circles around most anyone. They never seem to truly tire out went it comes to outdoor fun. They’re always ready to go. Chester and Gretel have enough energy. I’m not sure I could handle a JRT. Ha, ha. Cute little dogs though. I recently discover your blog and I must say I love! But I have to ask if your dachshunds are good on hikes with a lot of elevation changes? I meet a lot of people who say that they dogs are wonderful hikers but then it turns out that by hike they mean a 2 mile walk on a flat terrain. 😉 Compared to the other breeds you mentioned dachshunds have really short legs and it is just hard for me to see how could they jump without a problem on bigger rocks? Unless you always just picked them up whenever there are some difficulties on a trail? I have a friend who used to have dachshunds. He still loves this breed but after they died he got Jack Russell Terrier just because two od his dachshunds had a lot of health problems and on top of that one damaged his back on a hike, another damaged his back when he jumped off a couch. Hence me asking what type of hikes do you take with your dogs. My friend loves long and difficult hikes and unfortunately, at least his dachshunds, weren’t good for those type of hikes. His Jack Russell Terrier on the other hand is amazing and even 10 mile hike is nothing for that dog.